Microgeared-motor with a diameter of 1.5 mm and the gear reduction ratio of 40:1 using metallic glasses (MG) microgears were developed. Both of super-small size and heavy-load durability are realized due to the MG microgears exhibits over 10 times superior wear resistance than that of conventional steel. 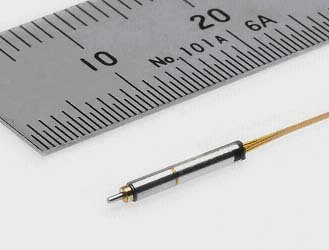 This microgeared-motor is expected to apply for medical devices such as endoscope, catheter and so on. It is now planning to commercialize till 2007. The result was reported in the 10 newspapers including Nikkei, Yomiuri and Asahi on Dec. 28 and broadcast by NHK and Miyagi-TV.